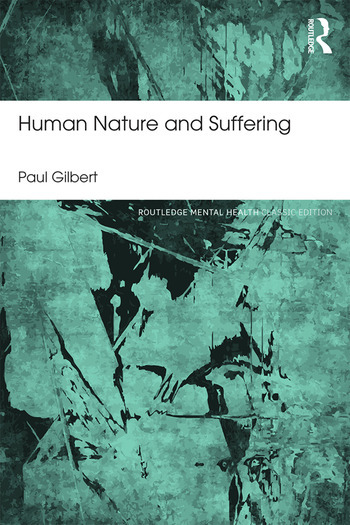 Human Nature and Suffering is a profound comment on the human condition, from the perspective of evolutionary psychology. Paul Gilbert explores the implications of humans as evolved social animals, suggesting that evolution has given rise to a varied set of social competencies, which form the basis of our personal knowledge and understanding. Gilbert shows how our primitive competencies become modified by experience - both satisfactorily and unsatisfactorily. He highlights how cultural factors may modify and activate many of these primitive competencies, leading to pathology proneness and behaviours that are collectively survival threatening. These varied themes are brought together to indicate how the social construction of self arises from the organization of knowledge encoded within the competencies. This Classic Edition features a new introduction from the author, bringing Gilbert's early work to a new audience. The book will be of interest to clinicians, researchers and historians in the field of psychology. Acknowledgments Introduction to Classic Edition 1. Introduction and Overview. 2. A Legacy from the Past: The Role of Human Nature. 3. The Mapping of Human Nature. 4. The Psychobiology of some Basic Mechanisms. 5. The Psychobiology of Peripheral Systems. 6. Care Eliciting and Attachment Strategies. 7. Care Eliciting and Theories of Psychopathology. 8. Care Giving and Nurturance. 9. Disorders of Care Giving. 10. Co-Operation. 11. Co-Operation: Some Blocks and Pathologies. 12. Competition: Status, Power and Dominance. 13. Some Psychopathologies of Power and Dominance. 14. Beyond the Power of Reason. 15. Personal Reflections. Appendices.